Madison River Ranch is a great development near the entrance to Cliff & Wade Lakes, with access to Beaverhead National Forest. 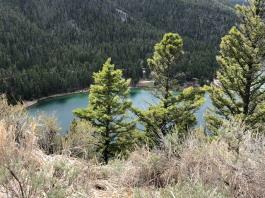 Beautiful 20-acre lots with fantastic views and good gravel roads. 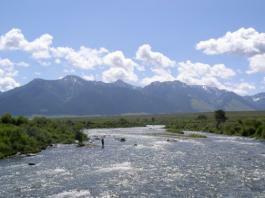 All owners have exclusive access to a private 55-acre common area park on the Madison River. The subdivision has locked security gates at both entrances. Good covenants and HOA protect property values. Home owner dues are approximately $200 per year. 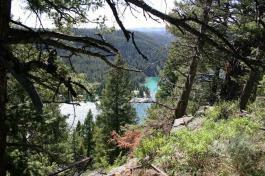 Lot 56 is a special lot with power, views of the river, mountains and valley. The lot starts on the upper road and drops off to a lower road so has lots of building options. A unique parcel. Lot 50 is a great 20-acre lot ideally located near the Main Gate, providing good winter access. Power and phone at the road. This is a cozy, corner lot nestled up against a high bench. Great views. Madison River Ranch lot 27 is a spectacular 20 acres bordering National Forest and overlooking Wade Lake with fabulous views and power along the road. 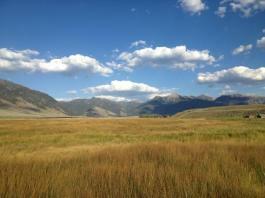 Madison River Ranch Lot 26 is a spectacular 20-acre parcel bordering National Forest and overlooking Wade Lake. 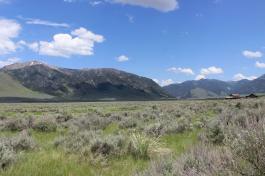 It slopes gently from the road, through open sagebrush, up to a heavy true-covered ridge. There are remains of an old homestead at the top. Near the back gate, close to Cliff and Wade Lakes. Custom home with spectacular views from majestic prow windows, large hand-peeled logs, beautiful hardwood and slate floors. The high-end finishes reflect the quality construction throughout. The 2,504 SF home has master BR, bath, kitchen and great room on main level + loft bedroom & 1/2 bath + unfinished daylight basement.